Welcome to the Block Tour Road Rally! 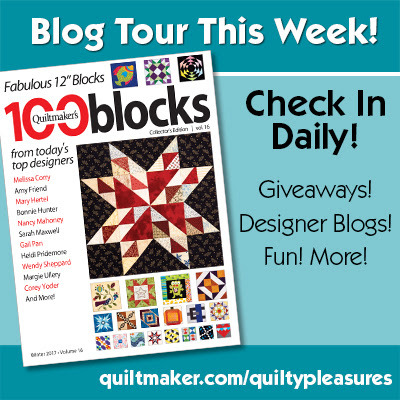 From today until Friday, November 17, Quiltmaker is celebrating the publication of 100 Blocks Volume 16 with a fun blog tour and lots of giveaways! I can't wait to visit all the other participating blogs because the blocks in this issue of the magazine are fantastic! Wait, my block is in there, too! "Best Friends Forever" is my new applique' block. 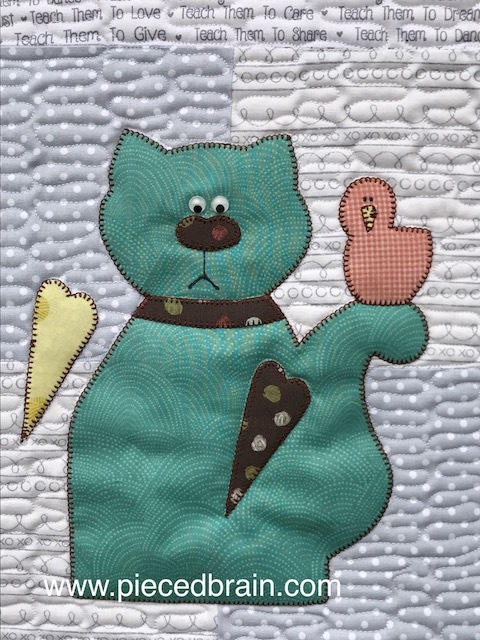 It is reminiscent of a stuffed cat I used to make and it occurred to me it would look awesome as a quilt block. What do you think? I added the bird as a reminder that, sometimes, our best friends are so not like us! It was very grey outside when I took these photographs as if to match the quilt background! How do you like my teal cats? Just as in the Quiltmaker's version, the applique' was done with 12wt thread (50wt in the bobbin) and blanket stitch. Brown seemed the best color to frame everything and by using 12wt thread I added a 'ridge' around the applique' making it pop. The fabrics are by Timeless Treasures, Riley Blake Designs, Wilmington Prints, and... Well, I have no idea where the fabric of the bird came from. I used a Frixion pen to outline the mouth and mark where I was going to place the eyes. After I took this photo, I made that mouth disappear by pressing it with my iron and redrew it. Then, the eyes were glued with a hot glue gun above the nose, the mouth was darkened using a Sharpie, and I carefully touched the tip of my iron to the mouth area to make the Frixion pen mark go away. Oh, if you want to change the placement of the eyes, just apply the iron on the back of the block - the glue will melt and you can reposition them. Ask me how I know. You can also embroider the mouth. Super easy, right? I free motion quilted this project with a 'spring' pattern, column by column, without marking anything. I like the texture it added to the quilt. For the backing, I used the Riley Blake Fabric from the center of the alternate block - so cute! It is from their Meow line and perfect for this project. 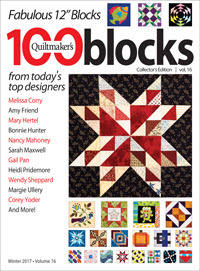 Quiltmaker has set aside one copy of 100 Blocks Volume 16 for me to give away to one of my readers. Just leave me a comment telling me how often you choose applique' for your projects, and if you prefer machine or hand applique'. 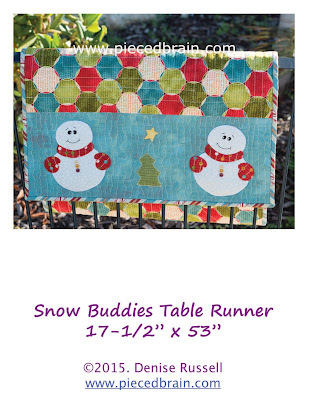 You will also win a copy of my Snow Buddies table runner applique' pattern to help you get ahead on your Christmas gift list! - If you are a no-reply blogger, be sure to include your email address as "soandsoatnomail.com" (I do not want you to receive spam mail). - For an additional entry, like my Facebook page. The winner will be revealed on Monday, November 20th. 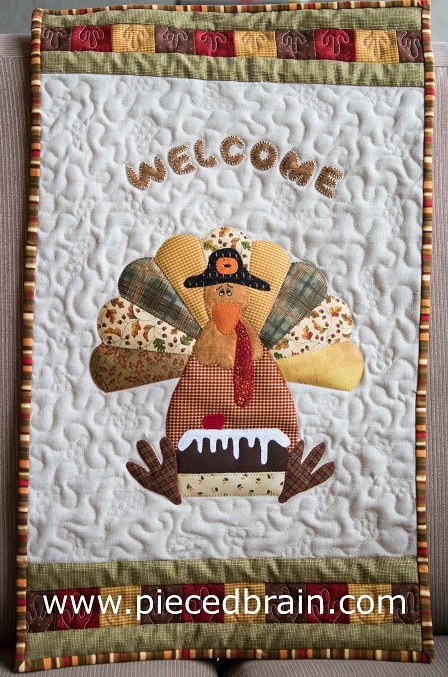 Speaking of applique', I have a cute applique' pattern for Thanksgiving in my Etsy shop called Turkey and Cake. It is downloadable, the price is only $6.00, it is fast to make, and your guests are sure to smile when they see it. Check it out! Are you ready to embark on the Block Tour? 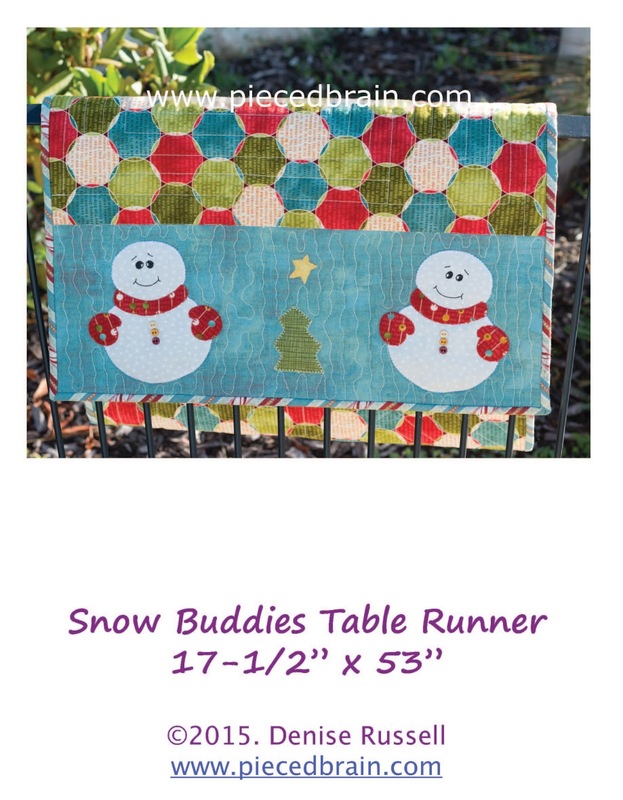 Leave a comment, like my Facebook page, and follow me to Quiltmaker's blog! Such a cute block you've made. I don't use appliqué often, but when I use it I always do it with my sewing machine. Thank you for your giveaway. What a darling block! Love it! So true what you said about sometimes our friends not looking like us, so sweet ;-D Congratulations for having your block included in Quiltmaker’s 100, Vol. 16, that’s great! 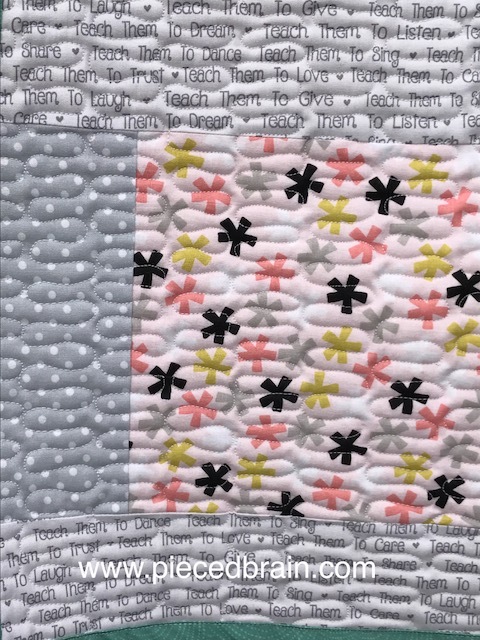 Your block would make a beautiful baby quilt as well. Great job! Thanks for a chance to win! I applique about 10 percent of the time, and most of those are machine appliqué. Thanks for the tip about repositioning the eyes--that's very clever. I do applique about 10%of the time. I do love it but hand applique takes a long time and there are so many quilts and so little time. I occasionally do machine applique, especially for children's quilts. One of these days I hope to do a Baltimore Album quilt. I never thought I'd be interested in appliqueing, but then the bug hit me!! I have been making table runners and wall hangings and am always on the look out for a new idea. I did realize that the blanket stitching takes a lot of practice!! Your cats are adorable! I applique about every fourth quilt I make. There are just some things that need to be appliqued. good morning Denise...I don't do applique that often, but....if I really like a piece, I'll do it. I like applique. Your block is so cute Denise! I love to do needle turn hand applique and do it as often as I can. I find it very relaxing. Plus I love the way it looks. Thank you for the chance. Very cute! 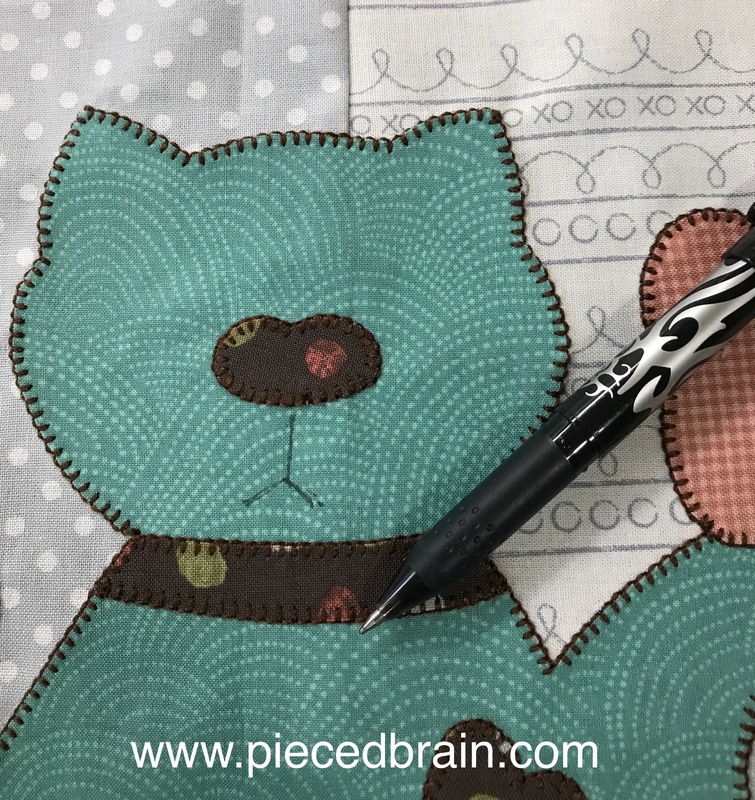 I love the look of applique, but don't do it often, and I have a very basic machine without any of the nice applique stitches, so when I do applique, it's by hand! What a cute kitty with personality! Best Friends Forever is so sweet! I have a block in Vol. 16, so no need to consider me for drawings...I just enjoy traveling the Road Rally and enjoying the stops! I really like machine applique and use it whenever I can. I recently finished a Row By Row quilt where most of the rows I used called for applique, so I was happy! Your cat block is cute! I do machine applique quite often, it's fun and makes anything possible. How exciting to have your block publichsed in this magazine...it's one I always look forward to seeing! I applique often, both by machine and by hand. I like to add applique to small projects and its always so refreshing! Very cute block!! I love applique and most of my quilts include some. I applique with sewing machine alot. I do it on quilts,and also for quiet books that I make. I used to love hand sewing, but I guess in my old age..if it can be done on a machine... that is where I prefer to do it! I don't applique much, but when I do, I use the sewing machine! I love your block! So cute! And i love applique very much and add it often to all my rojects. sewn by hand,lol! Both hand and machine applique are a favorite with me and like to add it in as much as possible in my quilts. My eyes are not great for hand applique, so I tend to use it less often than machine. I like both methods of applique and tend to machine stitch when I'm in a hurry. Both look good once the quilt is completed. Very sweet kitty and bird. I don't often use applique though I love the look. I have done both methods however and prefer machine stitching. I enjoy machine appliqué because it is faster, but sometimes I enjoy needle turn appliqué. 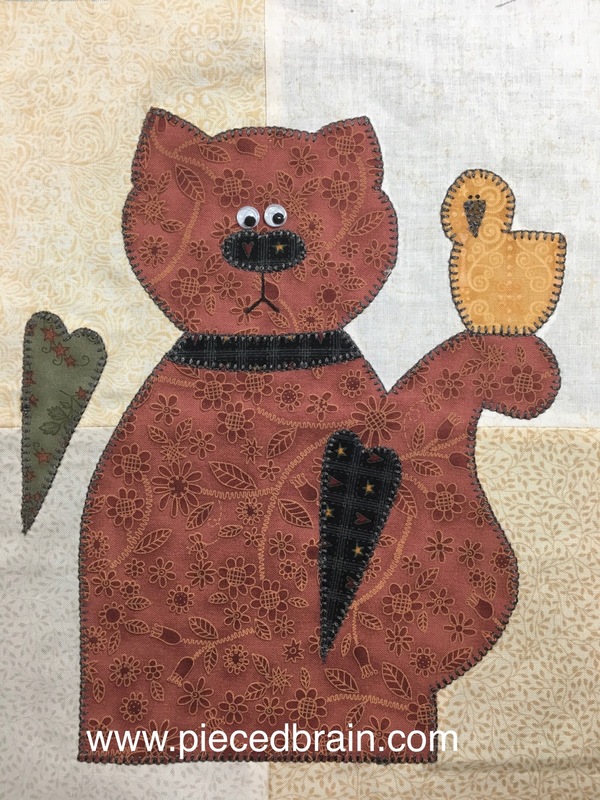 I prefer piecing to applique, but your designs are so wonderful (and my husband and I are cat lovers) that I will just have to do some applique -- preferably by machine. I use applique designs quite often, especially in the smaller projects. I prefer to machine applique. Your block is very cute! love your block! You are right -- sometimes our friends are not like us. I don't do too much applique, but when I do, it has to be done by machine due to wrist issues. Love your block! I usually applique by machine, but I'm currently doing a hand project in wool. I do a lot of machine appliqué -- especially this time of year. I haven't done any machine applique in a while but I did purchase a copy of Modern Illusions recently so I have plans to work on this again. No hand sewing for me if at all possible. Love the kitties as I look at my sewing buddy lying in my fabric. I do use applique, and it's always machine sewn! As always, your work is wonderful, Denise. Love the kitty block. I do quite a bit of machine applique. Still haven't finished my City Girl quilt though! Such a darling block! I love the kitty cats! I machine appliqué once in a while, and hand appliqué very rarely. 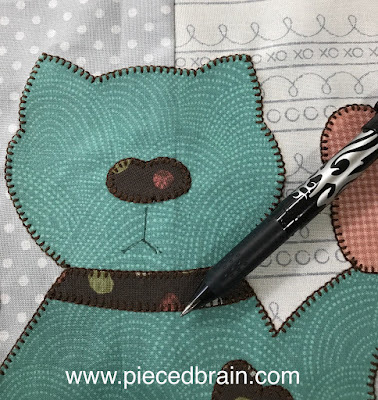 I love the look of a blanket stitch around applique, so glad I can do it on my machine. Adorable kitty, thanks for giveaway. I only do applique projects every now and then. When I do it's usually do machine applique because I'm generally in a hurry! I do love the look of hand applique though. I hand applique 90% of my quilts. Qute block! I do both machine and hand applique, my favorite is needle turn which I'm slowly learning. I love quilts with a combination of piecing and applique. What a cute little kittie block...perfect for a youngster. I like machine applique as I haven't perfected my needle turning. Thank you so much for sharing your beautiful fun block. Cute cat! I don't do a lot of applique - maybe once a year and I only know how to machine applique. I like applique--usually the patterns/quilts I immediately "oooh" over--but have only done hand applique so far. I'm hoping to attempt machine applique soon. Love the block! Elizabth, you won the giveaway! I have no way to contact you. Please email me as soon as possible. Thanks! I love cat blocks.! 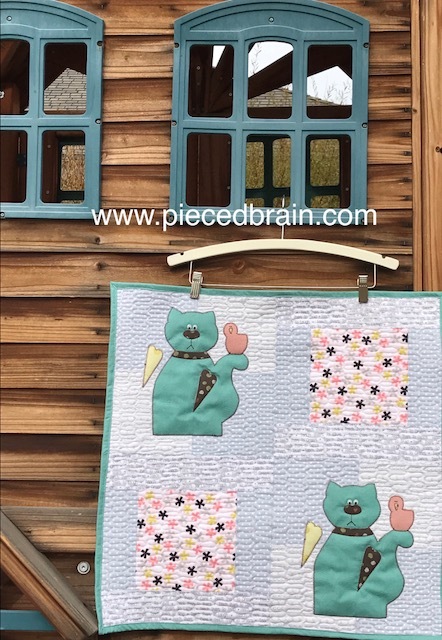 Yours is very cute, would make a really great baby quilt.i use appliqué about every other quilt I make, and use the machine method. I love the look of needle turn but want a quicker result. Your block is so cute. I have to admit, I have never appliqued. Just getting down this "hobby"/obsession of quilting. I do applique for Samplers. Having something to stitch while traveling is always nice. Sure brought a smile to me! Such a cute block! I'm a newbie appliquing quilter. Cute block! Love the Turkey too! I mostly do machine applique as it saves me some time. Love your block. Learning to machine applique is on my bucket list. Thanks. NIce to meet you! I checked out your Etsy shop....It looks like we're practically neighbors....I live just down I-15 a bit, in Payson! My appliqué skills are still developing. I've taught myself Hawaiian-style hand appliqué, and I've done some fusible machine appliqué. Appliqué is more fun than I thought it would be! I appliqué raw edge quite frequently. Thanks for sharing and designing such a cute block...Inlove cats! 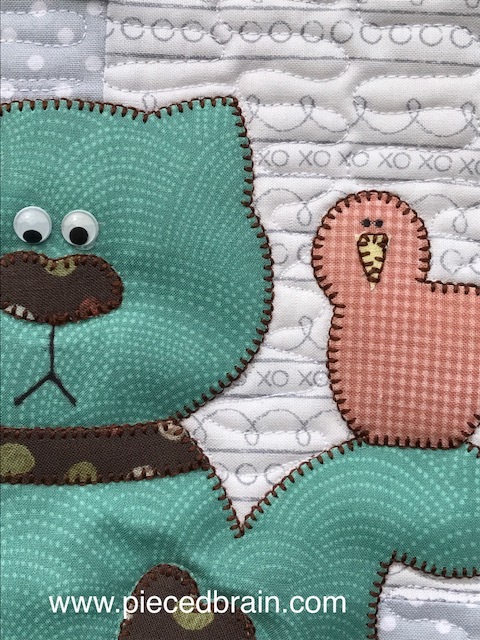 Your cat block is cute and might inspire me to do more applique. I prefer pieced blocks but have done fusible machine applique. I used to cringe at the "A-word", but I've learned to love it. I'm picking out lots of applique patterns now. I started doing it by machine, but now I'm really enjoying the hand work. I probably use applique in about one-fourth of my projects--have had best luck doing machine applique. First, I love the teal cats. I don't use applique as often as I would like. I usually tend toward machine applique due to time constraints. I do like hand applique and just need more practice to gain confidence. Congrats for the publish and a chance at the giveaway. I love your BFF's. The teal cat is really great looking. I have not done a lot of appliqué, but most of the appliqué that I have done has been by hand. I love to slow down when doing hand work and appliqué is great for that. Thank you for a chance to win. Really cute block. I do prefer piecing over applique, and do machine applique if needed. Thanks. I’m learning to like appliqué blocks more & more. And pets are too cute! I joined several bees this year which required me to do more applique then I have ever considered doing. Definitely all done by machine applique. I adore applique....My favorite next to embroidery. Love your block. And I am a major cat lover. With my 2 cats whom I adore more than anything. They are my fur children whom I have to fuss at a lot less than my human children. Your block is cute! I do not enjoy appliqué but I love how it looks. I do machine appliqué when using cottons and hand appliqué for wool. Such a cute block. I am a sucker for felines. I applique frequently, sometimes project after project is applique, sometimes one project is a mixture of applique and piecing, and sometimes there are a few pieced projects before applique takes over again. 90% of the time I machine applique, for the speed. Cute block! I often use applique for table runners, pillows, wall hangings, etc. (i.e. smaller than bed projects). Enjoyed reading your blog. I have a few friends I could make this block for. Thanks for sharing. Oops. I didn't put my correct email address in my comment. It should be ckrutjo at g mail dot com. 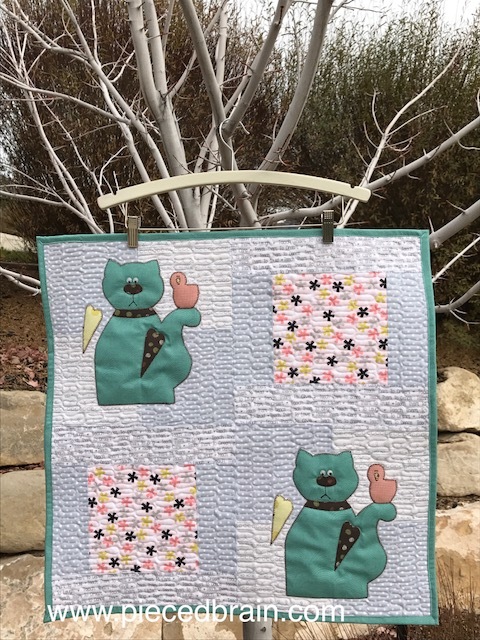 Gorgeous block, I have a thing about cats! I do make appliqué blocks from time to time, and I prefer machine appliqué. I have loved applique from the first time I tried it. Up until just a few months ago, I have always used fusible with a satin stitch, but since I have started hand applique I am totally in love with it also! Your Friendship Block is Awesome! I am hoping that I do win a copy of the magazine, so many spectacular blocks, like yours, that would have to be made! Thank you for sharing and have a great day! Olá!! !Amo costurar à mão,é leve e podemos levar para qualquer lugar.Lindos seus trabalhos como sempre.beijo Grande!!! I prefer Applique but don't get a lot of time for it as I love making baby quilts more. Thanks for the chance! I'm actually working on an applique quilt right now...a snowman, and I'm doing it by machine....so many messups! but I have to just go with it. Hi Denise, about every 5-6 projects (small ones that is) I choose machine applique. Thanks for all your tips w/the Frixion pen, outlining, etc. Love your BFF block. I love the cat and bird combo! I prefer needleturn appliqué but find my time limited right now and have done quite a bit of machine appliqué and like that, also. I must admit that applique is not my favorite method, but, fusible is my chosen method. I love doing applique and my favorite projects are a combination of piecing and applique. I usually do machine applique, but like to have one hand applique project on the go for a portable project. I have 2 projects right now that I am working on that have machine applique. I have another project that is using needle turn applique but I am finding it to be a little challenging. I think your cat block is adorable especially since it has my two favorite animals in it. I am just learning to do machine applique. It is fun to do. Machine applique is easy enough but I like the look of handwork. I really enjoy doing applique. My favorite method is stitching it by hand. Thanks for the opportunity to win. I will be honest and say I would rather EPP than applique but I love all kinds of handwork. Just need more time to do it all! I collect snowmen...LOL! I applique quite often. I like to hand applique during TV time, but I also machine applique when I am in a hurry. Your cat is so cute. He looks like he doesn't quite know what to make of the little bird on his tail. I love applique on quilts~ My favorite of all method! And that cat! o my Gosh, makes me giggle! I love him! I just finished a quilt with lots of applique, all by hand...have never tried on my machine! Pretty cat block,looks like fun! I rarely do applique, but when I do it is usually machine applique. I love the look of applique, and I do it by machine when I'm in a hurry and by hand when I want to relax. Thanks for sharing your delightful block! I like doing applique both hand and machine. I find hand applique very relaxing to do. I use machine applique with fusible when there are many sharp angles or fine details. This block brings back memories of making a stuffed animal out of fabric when I was little. I am new to hand applique but am falling in love with handwork. I love the cat/bird block! I only applique by machine. I prefer piecing but when I do applique, it is by machine. The turkey pattern is cute! I've just started doing some machine applique. I've never done any by hand except in a class.